Who says you can’t have colourful foliage all year round? 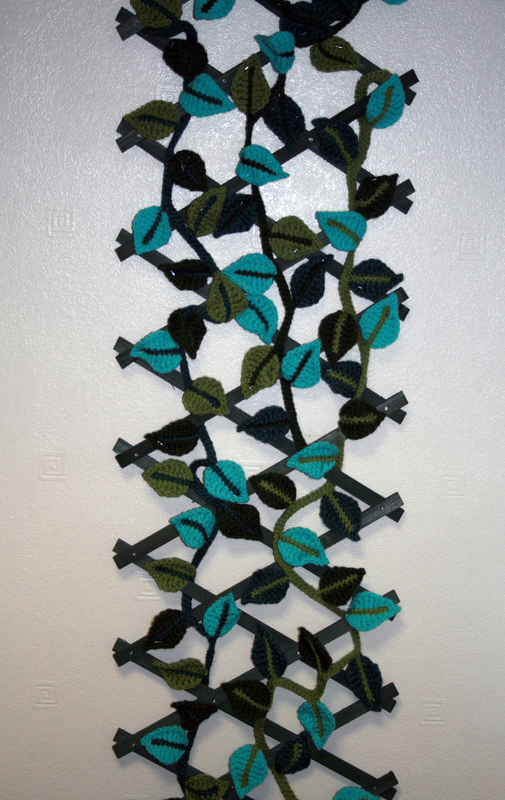 Crochet your own Leaf Garland and let it wind it’s way around a garden trellis. The beauty is you can choose the colours you want to use, not sure if I have ever seen turquoise leaves in reality but I liked the colour combo so who cares about reality? The trick is to twist the leaves as you place them on the trellis to give some dimension to them. They don’t look as real if you fix them to your trellis flat. I tried to take a photo from an angle to show this but am afraid it was quite difficult to get the shot right. I have done this leafy garland before and the last time I stiffened the leaves with PVA glue but this time I tried it without the glue and it works just as well. There are 3 garlands altogether on this one so it’s nice and leafy. Once you have made enough garlands for your trellis its good to wind them roughly into place before finally fixing them. This way you can make sure that you have enough and they are evenly spread across your display area. Here is the whole thing to give you a better idea of how the full piece looks. The 2 I made in the summer sold for £25.00 each so made a good contribution to our chatiry fund. This one has been made to order so will be going to take up residence in a new home soon.